I’m a believer in using the right flux for the job, and as such I keep a variety of electronics fluxes on my bench. Here are some of my favorites. MG Chemicals 835 is an electronics-grade activated rosin (RA) flux that is useful for a wide variety of soldering applications. The high activity rosin formula is helpful for soldering corroded copper wires and oxidized components or tarnished copper clad. It’s readily available at most electronics stores, inexpensive, and versatile. 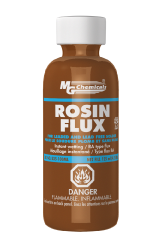 The biggest downside of this flux is that since it contains a very high solids content (50%), it tends to leave gummy rosin residue on everything it touches (including your fingers). This flux is also available in a flux pen. The RA designation implies that all flux residue should be thoroughly removed after soldering to prevent long term corrosion and electrical leakage. Kester 186 (datasheet) flux is a lower solids content RMA flux (36%) and IMHO the ideal compromise between activity and residue. If I had one flux on my bench, this would be it. Kester sells it in flux pens or by the gallon (and one gallon will last years in even the busiest prototyping lab) but fortunately you can buy smaller bottles on eBay. Kester claims the residue can be left on your PCB but I usually clean it off if long term reliability is a concern. Kester 951 (datasheet) is a low solids (2%) rosin-free no-clean organic flux that is useful for situations where cleanup would be difficult or impractical and flux residue must be minimized. This flux is surprisingly readily available on eBay and seems to be very popular with the Xbox repair crowd. It is the lowest activity flux I have on hand and can be frustrating to use if the components to be soldered are anything but spotlessly clean. During soldering, this flux remains active for a matter of seconds before largely evaporating. I would avoid it unless you’re doing really fine work (eg. soldering close to bare die) where removing flux residue might damage bondwires or sensitive components. 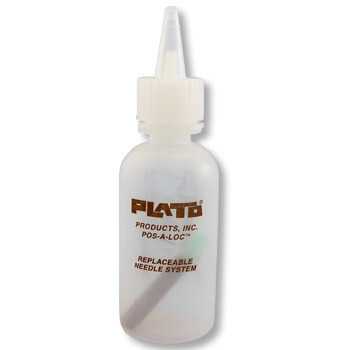 These Plato flux dispensers are my favorite dispensing tool and are perfect for applying a precise drop of flux to just the right spot on a PCB, minimizing mess and cleanup. They are inexpensive, high quality, and easy to use. These are available from many distributors (Techni-Tool, Mouser, etc. ), but I usually order from All-Spec because they typically have the best pricing. I prefer the Plato FD-21 (0.010″ needle) for thinner fluxes such as Kester 186 and the FD-2 (0.020″ needle) for thicker fluxes like MG Chemicals 835.